Bixa orellana L. (achiote) is a commercially important plant grown for its natural dye annatto, which is derived from the arils of seeds. Annatto, which contains the antioxidant bixin, is used in food, cosmetic, and textile industries as a natural colorant. Even though B. orellana can be propagated by seed, established tissue culture and in vitro propagation protocols exist for this plant. Organogeneses, both axillary and adventitious, as well as somatic embryogenesis, have been successfully induced from different explant sources, including cotyledons, hypocotyls, roots, stems, and leaves, and effective acclimatization protocols exist for regenerated plantlets. This present mini-review highlights the achievements in the tissue culture of achiote. In addition to using in vitro techniques for the clonal propagation of elite plants, knowledge from these protocols could be used to establish mass production systems, such as bioreactors, to facilitate year-round bixin harvest. The genus Bixa (Bixaceae) contains five accepted species (Baer 1976; The Plant List 2019), of which the most popular and commercially exploited is Bixa orellana L. (achiote), an evergreen shrub native to tropical Central and South America and cultivated for its seeds there, and in other tropical countries around the world (Leal and Michelangeli De Clavijo 2010). To avoid confusion that could arise because the English common name for B. orellana—annatto—is shared with the name of the dye derived from the plant, the Spanish designation ‘achiote’ has been employed throughout the present review to denote the plant. The major constituent (70 to 80% w/w) of dried seed arils that contributes to annatto, a coloring agent used in food, cosmetic, and textile dyes, is the carotenoid bixin (BXN; 9′Z-6,6′-diapocarotene-6,6′-dioate), whereas the water-soluble norbixin (NBX) is found in smaller amounts (Saha and Sinha 2012; Tupuna et al.2018). Natural cross-pollination and resulting heterozygosity make it impossible to propagate elite achiote clones or varieties by seeds, because progenies do not represent the original genotype (Rivera-Madrid et al.2006; Pech-Hoil et al. 2017). 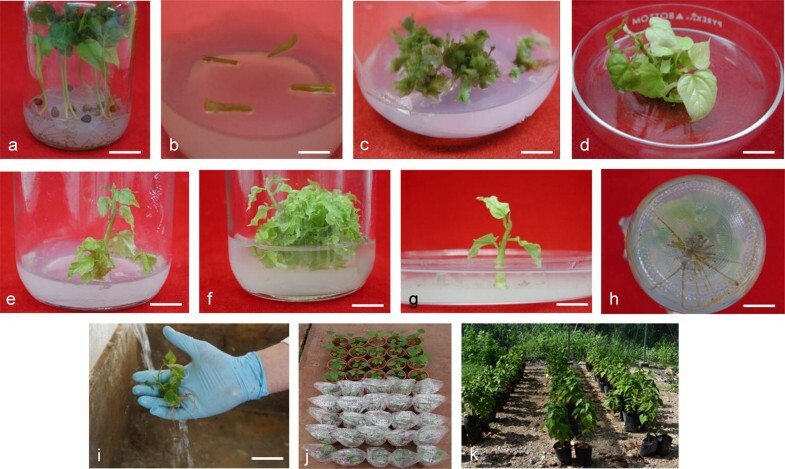 Even though B. orellana can be vegetatively propagated by softwood or hardwood cuttings (Joseph et al.2011b, 2012; Lombello and Pinto-Maglio 2014), tissue culture and in vitro propagation of selected clones or varieties are the most effective ways to produce genetically uniform plant material (Siril and Joseph 2013) for agricultural and industrial purposes. In vitro biotechnology is thus an important means to mass-produce clonal achiote plants with consistent BXN content and growth properties. This present short review explores the advances made to date in achiote in vitro tissue culture to better achieve these objectives. Tissue culture forms the basis of achiote molecular biology and genetic engineering protocols (Teixeira da Silva et al.2018). The molecular genetics of the biosynthetic pathways underlying BXN production is well understood, but those studies relied almost exclusively on mature seed (Teixeira da Silva et al.2018), so the use of year-round available clonal tissue-cultured material would greatly benefit achiote genetic and molecular studies. Therefore, the present mini-review provides a summary of the achievements in achiote tissue culture to date that would allow novice researchers unfamiliar with the plant to establish in vitro cultures or that would provide more experienced researchers a basis to optimize and expand their protocols for testing new variables, such as salt or water stress, in a controlled in vitro environment. The first report in an academic journal on the tissue culture of B. orellana emerged in 1996 (Almeida et al.1996) using leaf explants, and several protocols were developed thereafter using a range of explant sources (Table 1; Fig. 1). In the following sections, the important procedures required to achieve the tissue culture of achiote are described. Seeds in 70% (v/v) EtOH for 5 min, 3× with SDW, 0.5% NaOCl‡ for 15 min, 3× with SDW. Leaves from 3-wk-old seedlings treated with 70% (v/v) EtOH for 2 min, 3× with SDW, 0.1% NaOCl‡ for 20 min, 3× with SDW, then 0.5% streptomycin sulfate for 20 min. Explants = leaves 5 mm long with some petiole. MS + 2.22 μM BA (SIM). PGR-free ½MS (RIM). 16- PP. 1000 lx. 25°C. pH 5.8. 3% (w/v) sucrose. 0.8% (w/v) agar. After 60 d, 15.7 shoots per explant. Use of Castello et al. (2012b) protocol (Sharon and D’Souza 2000, Sharan et al.2012, and Sharon et al.2012 did not describe the full protocol). Explants = 5 to 8-mm-long shoot tips and 5- to 25-mm-long nodes from 6-wk-old seedlings. MS + 9.84 μM 2iP + 0.27 μM NAA (CIM). B5 + 4.9 μM 2iP (SIM; SEIM 2012). MS + 0.5 μM (shoot tips) or 2.7 μM (nodes) NAA (RIM). 16- PP. 80 μmol m−2 s−1. 25 ± 2°C. pH and carbon source NR. 0.8% (w/v) agar. Shoots formed from both explants in 4 wk. (9.1 per shoot tip; 5.9 per node). 80% survival of acclimatized plantlets in coco peat. Seeds from mature capsule of 6-y-old tree washed in 1% Teepol for 15 min, RTW for 15 min, 70% (v/v) EtOH for 2 min, 0.05% (w/v) HgCl2 + a few drops of Tween®-20 for 10 min, 3× with SDW. MS + 2.5 μM BA +5 μM NAA (CIM, SIM). ½MS + 5 μM IBA (RIM). Darkness (CIM). 16- PP, 50 μmol m−2 s−1 (SIM, RIM). 25 ± 2°C. pH 5.8. 2% (w/v; RIM) or 3% (w/v; CIM, SIM) sucrose. 0.8% (w/v) agar. Callus induced in 6 wk. in 63.8% of seeds and 75% of callus formed shoots (6.7 shoots/callus cluster). 86% of shoots rooted, forming 12.5 roots per shoot. Flower buds > 0.7 cm long washed in soapy water, then 70% (v/v) EtOH for 3 min, 5.25% NaOCl‡ for 5 min, 3× with SDW, removal of petals, 2.5% NaOCl‡ for 5 min, 3× with SDW. Explants = anthers. MS + 8.89 μM BA +21.48 μM NAA or 19.68 μM IBA + 100 mg L−1myo-inositol (CIM). MS + 8.89 μM BA + 21.48 μM NAA + 100 mg L−1myo-inositol (SEIM). PGR-free MS 60 d then PGR-free ½MS (SE germination). 12- PP. 32 μmol m−2 s−1. 23 ± 3°C. pH 5.8. 2–3% (SE germination), 4% (w/v; CIM), or 6% (w/v; SEIM) sucrose. 0.25% (w/v) Phytagel®. Callus induced in 21 to 28 d. SEs induced in 120 d. 12 to 18% of SEs were abnormal. Immature seed from green, immature capsules from 10-y-old tree (‘Fruto Verde Piloso’ X ‘Fruto Vermelho Liso’) removed at 70 d after anthesis, and dipped in 70% (v/v) EtOH for 1 min, 10% (w/v) Ca(ClO)2 for 2 min, 3× with SDW. Testa removed and ZE used as explant. MS + B5 vitamins + 100 mg L−1myo-inositol (seed germination) + 1 g L−1 AC + 2.26 μM 2,4-D + 4.52 μM Kin (SEIM). 16- PP. 36 μmol m−2 s−1. 27 ± 2°C. pH 5.7. 3% (w/v) sucrose. 0.28% (w/v) Phytagel®. First embryogenic response observed after 25 d of culture in 68% of explants. Medium without AC failed to form SEs and formed callus instead. Abnormalities, e.g., fluted and fused SEs, observed in all treatments. Seed from 10-y-old tree (‘Bico-de-Pato’) dipped in 70% (v/v) EtOH for 1 min, 10% (w/v) Ca(ClO)2 for 5 min, 5× with SDW. Hypocotyl segments (HyS; 9 to 10 mm long) and rooted hypocotyls (RHy; 40–50 mm long) from 15- to 20-d-old seedlings used as explants (shoots in 2009 study). MS + B5 vitamins + 100 mg L−1myo-inositol (seed germination) + 4.56 μM ZEA (SIM). SIM–ZEA + 5 μM IBA (RIM). 16- PP. 36 μmol m−2 s−1. 27 ± 2°C. pH 5.7. 2% (seed germination) or 3% (w/v; SIM) sucrose. 0.28% (w/v) Phytagel®. 78% of HyS and 85% of RHy formed shoots (1.8 and 3 shoots per explant, respectively). In SIM, 4.56 μM TDZ also induced same level of shoots, but these were abnormal (rosette-like). 70% or 80% of HyS- or RHy-derived shoots formed roots (5 and 7.3 per shoot, respectively). In the 2009 study, 5 μM NAA also effectively stimulated roots. Callus at the base of shoots was stimulated by adding 5 or 10 μM ACC (ethylene precursor), but reduced by adding 5 or 10 μM AVG (ethylene inhibitor). When sucrose was replaced by mannose, shoots could grow, but not as well. Seeds in 70% (v/v) EtOH 5 min, 4.5% NaOCl‡ 7 min, 3% NaOCl‡ 18 min, SDW for 3 d.
PC-L2 medium + 4.44 μM BA (SIM). Continuous light. 40–60 μmol m−2 s−1. 25 ± 2°C. pH and carbon source NR. 0.8% (w/v) agar. Transient Agrobacterium-mediated transformation experiments for ‘Peruana’ and ‘Criolla’ in which regeneration was NR. Seeds in Isodine® 60 min, 100% EtOH 1 min, 2% NaOCl‡ 20 min, 3× with SDW. MS (seed germination). Darkness, then after germination, 16- PP, 50 μmol m−2 s−1, 4-wk subculture. 25 ± 1°C. pH 5.7. 3% (w/v) sucrose. 0.7% (w/v) agar. 78% germination (max.) over 7 wk. Testa of seeds from 10-y-old plants scarified, then placed in 70% (v/v) EtOH for 1 min, 2.5% (v/v) NaOCl‡ + 0.1% Tween®-20 for 20 to 25 min, 5× with SDW, finally 24 in SW at 100 rpm (26 ± 2°C). MS + B5 vitamins (seed germination) + 100 mg L−1myo-inositol + 2.28 μM ZEA + 0.3 μM IAA (hypocotyl segments) or 4.56 μM ZEA (cotyledonary nodes) (SIM). MS + B5 vitamins + 100 mg L−1myo-inositol + 1% (w/v) glucose + 1% (w/v) maltose + 2.28 μM ZEA + 28.87 μM GA3 (SEM). ½MS + B5 vitamins + 50 mg L−1myo-inositol + 5 μM IBA (RIM). 16- PP. 36 μmol m−2 s−1. 27 ± 2°C. pH 5.7. 2% (SIM, RIM) or 1% (w/v; SEM) sucrose. 0.28% (w/v; SIM) or 0.3% (w/v; RIM) Phytagel® or 0.8% (w/v) agar (SEM). 100% of hypocotyls formed shoots (3.35 shoots per explant). Polyploidization (tetraploidy and mixoploidy) induced in shoots derived from cotyledonary nodes, when 15 μM oryzalin added to SIM and cultured for 15 d. Tetraploids had fewer, but larger, stomata. Stems, leaves, and roots (5 mm2) from in vitro plants. MS + 4.64 μM Kin + 5 μM NAA (CIM). Darkness. 25 ± 1°C. pH 5.7. 3% (w/v) sucrose. 0.7% (w/v) agar. After 8 wk., 17%, 59%, and 78% of roots, stems, and leaves, respectively, formed callus. Seeds from 4-y-old tree into 0.5% (w/v) Bavistin for 2 at 90 rpm, SDW, 65°C water for 1.5 , RT (25 ± 2°C) water for 7 d, 2% NaOCl‡ + 2 to 3 drops of Tween®-20 for 15 min, 3 to 4× SDW (5 min each), 0.1% (w/v) HgCl2 for 5 min, 3× SDW. Leaves (1 cm2), hypocotyl segments (5 to 7 mm long), and rooted hypocotyls (50 to 65 mm long) were used as explants. MS + 9.08 μM TDZ + 0.25% CW (CIM, SIM). MS + 6.66 μM BA + 4.92 μM IBA (SEM). Darkness for 15 d, then 16- PP. 45 μmol m−2 s−1. 25 ± 2°C. pH 5.8. 3% (w/v) sucrose. 0.7% (w/v) agar or 0.35% (w/v) Phytagel®. 80% of rooted hypocotyls formed shoots (20 to 22 per explant vs. 2 to 3 in hypocotyls). Absence of CW induced rosetting. 60% of cotyledons formed shoots (1.9 per explant) when 31.1 μM BA + 0.54 μM NAA substituted TDZ + CW in SIM. In these cases, callus was also induced. Callus avoided by culturing hypocotyls in 1.11 μM BA + 2.85 μM IAA, but only 50% of explants responded (30.5 shoot buds per explant). 70–80% survival after acclimatization in sand + compost (1:2). First, 70% (v/v) EtOH for 2 to 3 min, then Parimalan et al. (2007) protocol. Explants = shoot tip with a single node, shoot tips, and nodes. MS + 31.1 μM BA + 14.7 μM PAA (SIM). MS + 13.3 μM BA + 7.3 μM PAA (SEM). MS + 4.9 μM IBA (RIM). Darkness for 15 d, then 16- PP. 45 μmol m−2 s−1. 23 ± 2°C. pH 5.8. 3% (w/v) sucrose. 0.7% (w/v) agar. Only shoot tip with a single node formed shoots (34.3 per explant). In SIM with 14.8 μM 2iP + 14.7 μM PAA, 100% of shoot tips with a single node formed shoots (30.1 per explant); 4.1 roots formed per shoot. 90% survival in sand + compost (1:2) and 73% after acclimatization to the field. As for Parimalan et al. (2008) protocol. Explant = shoot tip with a single node. MS + 8.87 μM BA + 0.05 μM IAA + 11.2 μM TRIA (CIM, SIM). MS + 6.66 μM BA + 2.45 μM IBA (SEM). MS + 4.9 μM IBA (RIM). Darkness for 15 d, then 16- PP. 45 μmol m−2 s−1. 23 ± 2°C. pH 5.8. 3% (w/v) sucrose. 0.7% (w/v) agar. 18 shoots per explant in 80% of explants. When IAA + TRIA were substituted with 400 μM putrescine, 12.8 shoots formed per explant (2011a). 2.56% seed dye (DW basis) from tissue culture plant vs. 2.15% in in vivo seedlings (59.6 vs. 58.1 fruits, respectively) measured in 24-mo-old plants. Intact fruits from 4-y-old tree into 1% (w/v) Labolene for 30 min, rinsed several times in water, 0.1% (w/v) Bavistin for 1 , washed, 0.1% (w/v) HgCl2 + a few drops of Tween®-20 for 10 min, several rinses with SDW, flamed in alcohol. Excised seeds cultured. Explant = nodal segments (1.5 to 2.0 cm) of axenic seedlings. MS + 3 μM GA3 (seed germination). MS + 5 μM 2iP (SIM, SMM). MS + 10 μM IBA (RIM). 16- PP. 36 μmol m−2 s−1. 25 ± 2°C. pH 5.8. 3% sucrose. 0.7% (w/v) Bactoagar. 93% seed germination with GA3 (vs. 13% in GA3-free control). 93% of explants formed shoots (35.7 shoots/explant) (10 μM BA in SIM was also effective, but with a lower maximum of 76% and 23.3 shoots per explant). Seeds from 5-y-old trees into 0.5% Bavistin for 2 at 90 rpm, SDW, 65°C water for 1.5 , RT (25 ± 2°C) water for 7 d, 1% (v/v) NaOCl‡ + 2 to 3 drops of Tween®-20 for 15 min, 3 to 4× SDW (5 min each), 0.1% (w/v) HgCl2 for 5 min, 3× SDW. Explants = collar region (1 cm) and taproot portion from 45-d-old seedlings. MS + 0.2 mg L−1 niacin + 0.2 mg L−1 pyridoxine HCl + 0.2 mg L−1 thiamine HCl + 3% (w/v) sucrose + 0.49 μM IBA (RIM). 16- PP. 40 μmol m−2 s−1. 26°C. 60–70% RH. Constant shaking of cultures at 100 x g (gyratory shaker). Maximum root growth was 152 ± 2.5 mg by 8 wk, but by 9 wk and 10 wk the roots became brown. The pigment-producing areas of roots were seen microscopically at × 20 and × 40 magnification. Pigment conc. reached 346 ± 3.8 mg (100 g DW)−1 at 134 ± 2.8 mg root biomass by 45 d of culture. Immature fruits from 5-y-old plants in 70% (v/v) EtOH for 5 min, seeds excised, and added to 70% (v/v) EtOH for 1 min, 2× with SDW. Explants = whole immature ZEs or hypocotyls. MS + B5 vitamins + 0.44 μM BA + 0.054 μM NAA + 2.89 μM GA3 + 0.011 μM TRIA + 0.02 μM TIBA (SEIM, ZEs). MS + 10.2 μM BA + 1.07 to 2.14 μM NAA (CIM), → MS + 4.44 μM BA + 40 μM AgNO3 + 0.011 μM TRIA (SEIM, hypocotyls). MS (solid or liquid) + 0.44 to 4.44 μM BA + 0.54 to 2.69 μM NAA + 4.92 μM 2iP + 108.6 μM AdS (SE germination and growth). 28.6 SEs per explant after 16 wk. 24.8 shoots per SE. SEs were transformed with Agrobacterium tumefaciens. Seeds in 2% NaOCl‡ + a few drops of Tween®-20 for 10 min, 0.2% (w/v) HgCl2 for 5 min, 3× with DDW (5 min each rinse). Explants = zygotic embryo, cotyledon, testa with tegument, whole seed, and 1-mo-old seedling: (shoot tip (5 mm), node (5 mm), hypocotyl (5 mm), root (20 mm)). MS + 9.84 μM 2iP + 0.27 μM NAA (CIM). All other conditions NR. No seed-derived explants produced callus, only seedling-derived explants. Only hypocotyls and roots produced pigments. The addition of carotenoid precursors did not enhance BXN production. Seeds in 1% (w/v) Bavistin + 400 mg L−1 chloramphenicol for 3 (rotary shaker at 100 rpm), then SDW. Seeds then placed in 2% NaOCl‡ + a few drops of Tween®-20 for 10 min, 0.2% (w/v) HgCl2 for 7 min, 3× with DDW. All in vitro conditions NR. MS was better than ½MS and B5 (no data shown). Autoclaved 70°C water for 1 , then at RT (25 ± 2°C) for 6 d = 90% germination in 13 d. 500 mg L−1 (2.32 mM) Kin for 1 d = 90% germination in 8 d.
Seeds into 0.1% (w/v) laboline for 15 min, wash under RTW for 30 min, 70% (v/v) EtOH for 1 min, 0.1% (w/v) HgCl2 for 15 min, 3 to 4× SDW, soak in sterile water for 3–4 . Seeds were placed onto ½MS + 0.44 μM BA and 15-d-old seedlings were transferred to MS + 8.89 μM BA + 3% (w/v) sucrose and explants were selected from that plant material. MS + 18.2 μM TDZ + 3% (w/v) sucrose + 0.8% (w/v) agar (SIM). SIM–TDZ + 5.71 μM IAA (SMM). ½MS + 11.42 μM IAA (RIM). pH 5.8. 16- PP. 2000 lx. 25 ± 2°C. Highest frequency of shoot regeneration occurred from cotyledonary explants relative to shoot tips or hypocotyls. Testing single and combined application of cytokinins (BA, KIN, TDZ in the range of ~ 2.23 to ~ 22.3 μM) and auxins (IAA, IBA, NAA in the range of ~ 0.5 to ~10 μM) for shoot multiplication, 18.2 μM TDZ regenerated the highest percentage of plantlets (71%, at 5.35 shoots per culture) from cotyledonary nodes. Testing individual auxins (range of ~ 2.7 to ~ 18.7 μM) or combined application of IAA, NAA, and IBA, highest rooting was induced using 11.42 μM IAA. After shoots elongated, 60% rooting with 2.71 roots per shoot. Plantlets successfully acclimatized in sand, soil, and manure (1:1:1) with 40% field survival. As for Joseph et al. (2011a). Cotyledonary leaves and leaves (1.5 to 2.0 cm) of axenic seedlings used as explants. As for Joseph et al. (2011a), except that 20 μM BA substituted for 5 μM 2iP in SIM. Intact/full lamina more effective than leaf segments, inducing shoots in 67% of explants (11.2 shoots per explant; 12.4 shoots per cotyledon). 5–6-cm-long shoots washed in RTW for 30 min, 1% (w/v) Labolene for 20 min, 0.1% Bavistin for 1 , 85% (v/v) EtOH 30 s, 0.05% (w/v) HgCl2 for 5 min, 4 to 5× with SDW. Excised seeds cultured. Segments (1 to 1.5 cm) used as explants. As for Joseph et al. (2011a), except that 1 μM BA + 10% (v/v) tender CW substituted for 5 μM 2iP in SIM. MS + 15 μM IBA (RIM). 66.6% of explants formed shoots (3.5 per explant). Shoots collected in March and September most receptive. 55% of shoots formed roots (4.1 roots per shoot). 10 mM IBA induced rooting ex vitro in 61.1% of shoots (11.6 roots per shoot). No morphological or molecular (RAPD) deviation reported. Testa of seeds from 16-y-old plants scarified, then placed in 70% (v/v) EtOH for 1 min, 2.5% NaOCl‡ + 0.1% (v/v) Tween®-20 for 20 min, 5× with SDW. Explants = 10–20 mm fragments of 1-mo-old seedlings. MS + B5 vitamins + 0.01% (w/v) myo-inositol (seed germination). MS (liquid) + 4.56 μM ZEA or 4.54 μM TDZ (SIM). MS + 4.44 μM BA (SEM). Darkness for 15 d, then 16- PP, 36 μmol m−2 s−1 for another 15 d. 27 ± 2°C. pH 5.7. 3% (w/v) sucrose. 0.8% (w/v) agar. 32% of root segments formed shoots on SIM. 80% survival when shoots were rooted ex vitro in HT Plantmax® substrate. Nodal and intermodal segments of 16-y-old trees developed by air layering (Mantovani et al.2010) were cleaned with kitchen detergent for 10 min, soaked in RTW for 24 , then shaken in a solution with 0.2% (w/v) Agrimicin, 0.2% (w/v) Mancozeb, and 0.01% (w/v) Nistatin for 2 , rinsed in deionized SDW, treated with 1:1 H2O2 for 5 min, rinsed in deionized SDW, 70% (v/v) EtOH for 5 min, 2.5% (v/v) NaOCl‡ + 0.1% (v/v) Tween®-20 for 30 min, 5× in deionized SDW. All segments trimmed to 1.5 cm in length, dipped in 0.05% (w/v) Timentin, 0.025% (w/v) Augmentin, and 0.01% (w/v) Nistatin, then plated in SIM. MS + B5 vitamins + 100 mg L−1myo-inositol + 4.92 μM 2iP or 4.44 μM BA (SIM). MS + 5 μM 2iP (SMM). 16- PP. 60 μmol m−2 s−1. 25 ± 2°C. pH 5.7. 3% (w/v) sucrose. 0.8% (w/v) agar. Axillary shoots formed from nodal sections (4.98 buds per explant in 2iP; 4.65 buds per explant in BA) and adventitious shoots from intermodal segments in 15% of explants (about 1 bud per explant). 37.5 shoots per explant in SMM with 93.3% explant response. Rooting NR but acclimatization claimed. Ripe fruits from 7-y-old tree, seeds washed with RTW for 2 min, 10% (v/v) Tween®-20 for 5 min, 5–60% (v/v) H2SO4 for 5–20 min, SDDW several times, 70% (v/v) EtOH for 1 min, 0.1% (w/v) HgCl2 for 2 min, 2× with SDDW. Leaf explants from 2-wk-old seedlings used as explants. MS (seed germination) for 5 to 7 d in dark. MS + 9.8 μM 2iP + 10.7 μM NAA (SIM, SEM; 2-wk sub-culture). MS + 14.7 μM 2iP + 1.7 μM IAA (RIM). 16- PP. 40 μmol m−2 s−1. 25 ± 2°C. pH 5.8. 3% (w/v) sucrose. 0.8% (w/v) agar. 80% of explants formed shoots (36 per explant). 78% of shoots rooted (6.8 roots per shoot). 95% survival in autoclaved vermiculite + perlite (3:1). Seeds of ‘Peruana roja’ morphotype soaked for 5 min in 70% (v/v) EtOH, 7 min wash in 4.5% NaOCl‡, then 18 min in 3.0% NaOCl‡, rinsed 1× in SDW. Seeds imbibed for 3 d in SDW before plating for germination on PC-L2 medium. Explant = hypocotyl explants (1 cm) from 5-wk-old seedlings. Seeds kept at 25 ± 2°C, under continuous light at 40–60 μmol m−2 s−1 for germination. PC-L2 medium + 4.44 μM BA (CIM, SIM). Histological analysis after 4 wk. Histological analysis indicated that shoots formed from callus tissue, i.e., indirect organogenesis. Seeds of 4 morphotypes disinfected as for Chi Chi et al. (2016). Explants = hypocotyl explants (1 cm) from 5-wk-old seedlings. Seeds kept at 25 ± 2°C, under continuous light at 40–60 μmol m−2 s−1 for germination. PC-L2 medium +4.44 μM BA (CIM, SIM). 0.8% (w/v) agar. PC-L2 liquid medium + 4.44 μM BA (SMM). PC-L2 liquid medium + 7.38 μM IBA (RIM). pH and carbon source NR (CIM, SIM, SMM, RIM). Hypocotyls in PC-L2 medium (CIM, SIM) formed shoots in 8 wk. Shoots (≥ 1.5 to 2.0 cm) transferred to SMM in 4 wk. Shoots (4 cm long) transferred to RIM in 3 wk. Rooted plantlets removed from culture medium, washed to remove residual agar, and transferred to pots containing a 1:1 mixture of soil: Agrolite. Plantlets acclimatized with 80% survival. Seeds washed with RTW for 20 min, 0.1% (w/v) HgCl2 for 30 s, SDW, 70% (v/v) EtOH for 1 min, 5× SDW. Germination in vitro for 10–15 d. Explants = nodal explants selected from seedlings. MS + 1.07 μM NAA + 10.2 μM BA + 0.26% (w/v) gelrite (CIM). pH 5.8. 16- PP. Light intensity NR. 25 ± 2°C. Carbohydrate content NR. Callus induced in 57% of nodal explants after 2 wk. Callus was used for genetic transformation (see text for details). Depiction of Bixa orellana L. in vitro (achiote) culture and acclimatization. (a) Germination of seeds on PC-L2 medium (Phillips and Collins 1979). Panel a was reproduced from Fig. 2 of Llanes-Cocom et al. (2016); (b) hypocotyl explants on CIM; (c) callus and incipient shoots on SIM. d) Multiple shoots; (e) individual shoot before liquid SMM addition; (f) proliferation of shoots in liquid SMM; (g) individual shoot for rooting; roots in RIM. (i) Washing plantlets to remove medium residue prior to transfer to pots; (j) plantlets in acclimatization stage; (k) acclimatized plantlets. See Table 1 (Chi Chi et al.2016; Llanes-Cocom et al.2016) for details of CIM, SIM, SMM, and RIM. CIM, callus induction medium; RIM, root induction medium; SIM, shoot induction medium; SMM, multiplication induction medium. Bars: (a) 2 cm; (b) 1.3 cm; (c) 1.2 cm; (d) 1.6 cm; (e) 1.5 cm; (f), 1.7 cm; (g) 1.9 cm; (i) 6 cm. Copyright of all images: authors. An important part of any tissue culture protocol concerns the successful disinfection of explants, since bacterial or fungal infection would limit all subsequent efforts to establish an in vitro culture, if these contaminants were not suitably removed prior to the introduction of an explant onto sterilized medium. In achiote, leaves or seeds are the most available tissues for explant preparation; however, when older tissues, such as mature stem tissue or mature leaves are used, the risk of medium contamination increases (Table 1). Thus, the most popular explants have been derived from in vitro plants, which in turn were either established from seeds that were surface disinfected and denuded by the removal of the testa (Fig. 1a) or from aseptically excised zygotic embryos. It should be noted here that the zygotic embryo represents genetically different material to the mother genotype, so if genetically identical tissue is required, then somatic tissues must be used. Seedlings, including their hypocotyls (Fig. 1b) and epicotyls, are also popular explant sources, because these tissues are young, actively growing, and almost free of infection if seeds were germinated under aseptic conditions, such as on sterilized vermiculite. The variation in source tissue explains the wide range of protocols listed in Table 1. As with many tissue culture studies, the vast majority of published protocols did not report the level of infection or the success of the disinfection process, thus it can only be assumed that the described protocol is the most effective. The most commonly employed disinfectants (used in 85.7% of the protocols in Table 1) are 70% (v/v) ethanol (EtOH), 0.5 to 4.5% (v/v) sodium hypochlorite (NaOCl), and 0.05 to 0.2% (w/v) mercuric chloride (HgCl2), applied alone (in 4.8% of the cases for EtOH and 9.5% for HgCl2) or in combination with each other (71.4% of the protocols). Although combining different disinfectants could theoretically eliminate different biological contaminants or improve efficiency, this practice could also negatively impact explant survival and subsequent growth of the explant tissue. The combination of EtOH and NaOCl was applied in 28.6% of the studies, whereas HgCl2 was combined either with EtOH or with NaOCl in 19% or 14.3% of the studies, respectively (Table 1). Only in two studies (9.5%) were all three disinfectants combined. Although the choice of disinfectant and the length of the decontamination influence the effectiveness of the disinfection process (Teixeira da Silva et al.2016), comparative studies of the effectiveness of the application of disinfectants and their combinations have not been conducted in any of the achiote tissue culture studies. Future basic research comparing a range of disinfection protocols for various explant types, ultimately resulting in a single optimized procedure for a wide range of explants, would greatly benefit achiote researchers. The compounds that have been used for explant decontamination to establish achiote in vitro cultures, as listed in Table 1, are suitable only for the surface disinfection of different explants. However, only recently were a series of endophyte species isolated from different organs of B. orellana, including stems, leaves, twigs, and flowers (Kannan et al.2017), several of which are frequently used to prepare explants for in vitro culture. The in vitro environment provides an artificial optimized milieu in which an explant can ultimately be induced to form desired organs or plantlets. While some achiote tissue culture studies tested ideal conditions, several did not, and assumed ideal conditions as were reported in previous studies, including basal medium, photoperiod, growth temperature, and other parameters. In the majority (92%) of published protocols, Murashige and Skoog (MS) salts and MS vitamins (Murashige and Skoog 1962) were applied to callus, shoot, or somatic embryo induction, and shoot multiplication (Table 1). The rooting medium also primarily consisted of MS salts and vitamins, at full or half strength. In about one-third of the protocols however, B5 vitamins (Gamborg et al.1968) were used along with MS salts. When different carbon sources such as sucrose (including cane sugar), fructose, glucose, or mannose were compared in several studies (Paiva Neto et al.2009; Joseph et al.2011a; Vijayasekhar et al.2012), sucrose was reported to be the most effective when applied at 3% (w/v) for shoot induction and proliferation, but in rooting medium the concentration could be decreased to 2% (w/v) sucrose (Khan et al.2002; de Carvalho et al.2005a, b). It should not be implied that 2% (w/v) sucrose is ideal for in vitro rooting, merely that this concentration has been used in several cases as effectively as 3% (w/v) sucrose. It should furthermore not be interpreted by the preceding statement that other carbon sources cannot be used in rooting medium; simply that rooting, as assessed by the percentage of shoots forming roots or by root length or root fresh weight, might not be as high or as productive, as with 3% (w/v) sucrose. For shoot induction and development, different cytokinin additions to the medium can be employed, with N6-benzyladenine (BA) most often applied alone (35% of the reports) or in combination with indole-3-acetic acid (IAA; 6%) or α-naphthaleneacetic acid (NAA; 6%) (Table 1). Similarly, a number of cytokinins were successfully applied for somatic embryo induction, but again, most often BA was used, alone or in combination with NAA or indole-3-butyric acid (IBA). The superiority of N6-(Δ2-isopentenyl) adenine (2iP) over BA was reported by Joseph et al. (2011a) in shoot regeneration from nodal segments of B. orellana seedlings. It was reported that using 5 μM 2iP 93% of explants was responsive, forming 35.7 shoots per explant, whereas BA at 10 μM induced a maximum of 76.8% responsive explants, forming 23.26 shoots per explant. When the effects of BA, thidiazuron (TDZ), and kinetin (Kin) were compared at a concentration range of 0.5 to 5.0 mg L−1 (approximately 2.22 to 22.2 μM), 4.0 mg L−1 (18.2 μM) TDZ was the most effective for shoot induction (71% regeneration, 5.35 shoots per culture) from cotyledonary nodes (Vijayasekhar et al.2012). The same study further reported that regeneration was higher from cotyledonary explants than from shoot tips and hypocotyls. The efficacy of BA and Kin with cotyledonary explants was lower than that of TDZ. N6-benzyladenine and Kin were most efficient when applied at 3.0 mg L−1 (13.35 and 13.95 μM, respectively); and their effects were similar to each other (55% and 65% shoot regeneration with 2.2 and 2.55 shoots per culture, respectively). Shoot regeneration could not be increased by the combined application of TDZ and different auxins (IAA, IBA, or NAA) in the Vijayasekhar et al. (2012) study, unlike in Parimalan et al. (2008), who reported the synergistic effect of auxin (phenylacetic acid; PAA) and cytokinin (BA) in B. orellana shoot development and proliferation (Table 1). Paiva Neto et al. (2003b) reported that TDZ, when applied at 4.56 μM, caused rosette-like, abnormal shoot development in shoots developed from hypocotyl or rooted hypocotyl explants. When shoot development was induced from root explants in liquid medium (da Cruz et al.2014), TDZ and zeatin (ZEA) induced twofold more shoots (31.7 and 31.9 adventitious buds per root segment, respectively) than BA (15.8 buds per root segment). On semi-solid medium that contained BA, no shoot regeneration was observed, but 4.9 and 2.2 buds per root segment developed on medium containing ZEA and TDZ, respectively (da Cruz et al.2014). However, the highest proportion (80%) of buds developed to normal elongated shoots in liquid medium containing BA, compared with shoot elongation with ZEA- or TDZ-containing media (40% and 5%, respectively). Therefore, the efficacy of ZEA and BA was the same, when the final number of elongated shoots (12.76 and 12.64 elongated shoots per root segment, respectively) was considered in the da Cruz et al. (2014) report. Adventitious shoot development was most effective (67% of explants with 11.2 shoots per leaf and 12.4 shoots per cotyledonary leaf, respectively) when full laminae were used rather than leaf segments (Joseph and Siril 2013). Godoy Hernández and coworkers (Chi Chi et al.2016; Llanes-Cocom et al.2016) established a protocol to regenerate B. orellana plants from hypocotyl explants (Fig. 1b) and generated shoots in 4 wk in the presence of 4.4 μM BA (Chi Chi et al.2016). Indirect organogenesis allowed individual shoots (Fig. 1e) to be rapidly and efficiently proliferated in BA-supplemented liquid medium (Fig. 1f; Llanes-Cocom et al.2016). A simple, rapid, and inexpensive method to micropropagate B. orellana from a single individual using 1 μM BA to form shoots (Fig. 1d) from callus (Fig. 1c), and 15 μM IBA to induce roots, was developed to ensure the in vitro production of genetically identical plants. The genetic uniformity of in vitro derived plants was also shown by Siril and Joseph (2013). These plants, derived from a single clone and cultured in the field (Fig. 1k), may achieve stable BXN production and might be considered for replacing current heterogeneous plantations. The above results suggest that the type of cytokinin that is optimal for shoot development is also likely to be dependent on the type of explant used, although further comparative studies are required to support this assumption. Inorganic and organic medium additives are able to increase regeneration. In the absence of activated charcoal (AC), Paiva Neto et al. (2003a) did not detect somatic embryo development from zygotic embryos, but when 1 g L−1 AC was added to the medium, 68% of the explants were responsive. Parimalan et al. (2007) observed shoot development on 80% of rooted hypocotyls, but in the absence of 0.25% (v/v) coconut water (CW), abnormal, rosette-like shoots developed. Siril and Joseph (2013), who compared the effect of 5, 10, 15, and 20% (v/v) of tender coconut water on shoot induction, found that 10% (v/v) CW most effectively increased the percentage of responsive nodal segments from 41.7 to 67.0%. By using 10% (v/v) CW in shoot induction medium, the number of shoot buds doubled (8.9 vs. 4.23), while significant increases in shoot number (3.36 vs. 2.06) and shoot length (3.53 vs. 2.9 cm) were also observed (Siril and Joseph 2013). Several achiote tissue culture studies have endeavored to induce roots (Fig. 1) from shoots (Fig. 1g) formed from shoot tips or axillary buds, or from adventitious shoots induced from explants such as leaves. In such cases, as for other plants, an auxin is generally applied. In the case of somatic embryogenesis, an auxin is generally not required for rooting, calling into question whether those studies (Parimalan et al.2011b; Sharan et al.2012; Sharon et al.2012) that employed an auxin to root their supposedly induced somatic embryos were in fact dealing with true somatic embryos. Even though IBA is the most frequently used auxin for inducing roots in achiote (Table 1), when comparing the individual or combined effects of IAA, NAA, and IBA, Vijayasekhar et al. (2012) found that 2.0 mg L−1 (11.42 μM) IAA was the most effective (60% rooting and 2.71 roots per shoot after 35 d on root induction medium), whereas IBA was least effective even at its optimal concentration of 2.5 mg L−1 (12.25 μM), with 25% rooting and 1.38 roots per shoot after 62 d.
In vitro-rooted achiote shoots (Fig. 1) can be successfully acclimatized in coco peat alone, 1:2 mixture of sand and compost, 3:1 mixture of vermiculite and perlite, or 1:1:1 mixture of sand, soil, and manure (Table 1; Fig. 1i, j). Plant survival after acclimatization (Fig. 1k) varied between 70 and 90%, although Vijayasekhar et al. (2012) reported that field survival was only 40%. 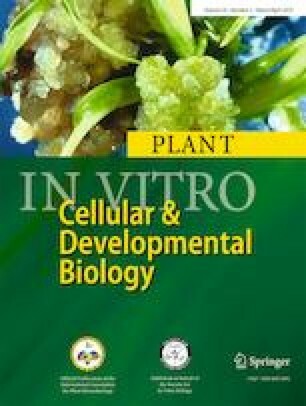 Ex vitro rooting in HT Plantmax® (Eucatex, Salto, Brazil) substrate and acclimatization of elongated in vitro shoots in a single step (da Cruz et al.2014) shortened the period necessary for obtaining plants from shoot culture (rooted and acclimatized plants within 40 d) and ensured a high (80%) survival rate. Although seeds are the in vivo carotenoid-storage organs of achiote, BXN and other carotenoids have been detected in different organs or tissues in vitro (Mahendranat et al.2011; Castello et al.2012a; Zhai et al.2014). This indicates possible industrial secondary metabolite production by using in vitro plant tissues. The ability to produce BXN in in vitro cultures would allow for year-round production, independent of the ability to produce and harvest seeds from field-grown plants in a seasonal manner. Moreover, it could ensure the selection of clones with high BXN production capacity. Only limited studies exist on secondary metabolite, including BXN, production in vitro, and further investigations are needed to optimize conditions for BXN production. A study by Castello et al. (2012a) found differences in secondary metabolite production, depending on the genetic background, explant source, and age of callus. For instance, callus derived from hypocotyl explants produced less BXN than callus derived from root explants; young callus produced BXN, but production decreased as callus aged; and BXN production from either hypocotyl- or root-derived callus could not be increased, even when a precursor (mevalonic acid) or intermediate compound (gerany-geranyl-pyrophosphate) of carotenoid biosynthesis was added to medium. Mahendranath et al. (2011) induced pigment production (maximum of 346 ± 3.8 mg per 100 g dry weight (DW) of roots) in in vitro root culture on MS medium with 0.1 mg L−1 (0.49 μΜ) IBA after 45 d of culture. Fungal bio-elicitors have also been employed to increase BXN production (Giridhar and Parimalan 2010). When Zhai et al. (2014) added a signaling molecule, methyl-jasmonate, to modified liquid MS medium containing 7.7 mM NH4+ and 22.85 mM NO3− for 24 , a 15-d-old hairy root culture of B. orellana (line 15) transformed with the Bixa orellana carotenoid cleavage dioxygenase 4a (BoCCD4a) gene (Sankari et al.2016) successfully increased the production of secondary metabolites, including ishwarane, ellagic acid, 5-tocotrienol, BXN, stigmasterol, β-sitosterol, ursolic acid, maslinic acid, inositol, and arjunolic acid; however, the production of each was not quantified. There are approximately three dozen tissue culture studies on achiote, all of which were conducted within the past two decades. Compared with many other commercially, medicinally, and pharmaceutically important species, this is not a large number of studies. Some of the protocols shown in Table 1 offer what may appear to be contradictory findings or different optimized conditions, but these differences likely reflect (1) different plant material from different environments, genotypes, explants, or culture conditions, or disparate levels of rigor of the research; and (2) a lack of studies that measured the effectiveness of protocols or their reproducibility, either because material was scarce or because funding for large-scale studies to assess optimized conditions that are independent of germplasm source or protocol were also scarce. Large-scale comparative studies have not yet been conducted on basic disinfection protocols or on ideal parameters reported in the studies highlighted in Table 1 but should be carried out and applied to a wide range of explants and genotypes. Besides in vitro propagation (organogenesis and somatic embryogenesis) of selected germplasm, there are possibilities for using other tissue culture methods in achiote breeding. From a breeding point of view, it is essential to have a germplasm repository of this species that focuses on pigment diversity and to implement an in vitro androgenesis protocol to create double haploids and thus attain pure lines (Rivera-Madrid et al.2016). Alternatively, the ability to induce flowers in vitro, as has been successfully done with orchids (Teixeira da Silva et al.2014), would permit the controlled production of flowers and seeds in vitro and would thus allow for seed production under controlled environmental conditions. However, although such a method would be useful for the production of flowers from which pollen could be harvested independent of season, given the cross-pollination nature of achiote, seed would likely be of variable yield and quality. Thus, such a method would not be appropriate for use in traditional breeding programs and further, its effect on BXN production would still need to be tested. Scientists involved in achiote research might consider exploring the use of ultrasound or sonication (Teixeira da Silva and Dobránszki 2014), thin cell layers (Teixeira da Silva and Dobránszki 2013), or magnetic fields (Teixeira da Silva and Dobránszki 2015) to study growth and development, thus supplementing comprehensive analyses of embryo structure and development conducted by Chopra and Kaur (1965) or of the androecium by Decraene (1989), maximizing organogenesis, or increasing the production of secondary metabolites. Large-scale experiments that test the ability to induce important secondary metabolites, primarily BXN, from a range of explants, media, and genotypes are needed. The use of bioreactors or feeding precursors into such systems or the use of Agrobacterium rhizogenes–induced hairy roots would allow for the automated production of biomass and ultimately of BXN and NBX, similar to other mass production systems used for food colorants (de Boer 2014). Although molecular markers have been used in marker-assisted breeding in achiote or to assess genetic diversity of fruit (Teixeira da Silva et al.2018), they have not been used to assess the genetic stability of tissue culture regenerants, but should be, in order to ensure clonal stability. Clearly, much work remains to be done on the optimization of achiote tissue culture, whether for mass propagation, breeding, or in vitro bixin production, and it is hoped that the current review provides an expedient starting point for such investigations. The research conducted by J. A. Teixeira da Silva and J. Dobránszki was financed by the Higher Education Institutional Excellence Programme of the Ministry of Human Capacities in Hungary, within the framework of the Biotechnology thematic programme of the University of Debrecen (20428-3/2018/FEKUTSTRAT). The study and submission for publication were approved by the University of Debrecen (BPTR/DEENK/0003/2019). R. Rivera-Madrid was supported by the Consejo Nacional de Ciencia y Tecnología (CONACYT) with grant No. 220259. G. Godoy was financially supported by CONACYT for Project No. 248736.